When Friends began restoration work at the Ecology Study Area in 1998, the site was filled with broom, periwinkle, and acacia and eucalyptus trees. This woodland site covers two acres adjacent to the multi-use path that links the college and Marin General Hospital, and is bounded by Corte Madera Creek and a tidal slough. 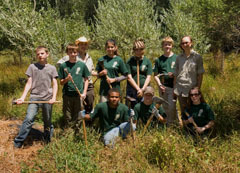 We initiated the project in 1998 by pulling broom and installing a small number of coyote brush plants and oaks. 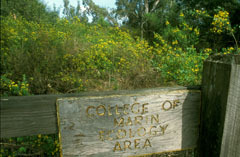 It has developed into a cooperative effort with the College of Marin, and has as its goal the eventual replacement of all eucalyptus and acacia trees on the site with a diverse woodland of native species. A team of North Bay Conservation Corps trainees helped with weeding out periwinkle. 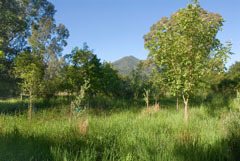 In early 2005 a large area was cleared of non-native trees and replanted with nearly 400 native plants. A survey was conducted previously, and trees were retained to ensure that roosting herons and egrets would be disturbed as little as possible. The most successful native tree species planted are: coast live and valley oaks; box-elder; and black walnut. Oregon ash grows vigorously initially, but voles de-bark the base, killing the tree. The main understory plants are whiteroot sedge (Carex barbarae), introduced by Friends, and the pre-existing native creeping wild rye (Elymus triticoides). Both spread rapidly given the opportunity. Whenever funds are available more eucalyptuses and acacias are removed, and Friends volunteers continue to remove periwinkle and non-native blackberry to expand the native plantings. A berm currently protects most of the area from tidal intrusion, however there is an opening in the southern corner, where several salt-marsh plant species are found. The rising sea level will jeopardize the riparian plants, unless preventive action is taken. Young trees planted by Friends, with Mt. Tamalpais visible beyond. Funding of the early planning phases was provided by the San Francisco Estuary Project. Funding for implementation has been provided by the Willis Evans Watershed Habitat Improvement Grant Program of the Marin Municipal Water District, and the California Alpine Club Foundation. Water for the temporary drip system is donated by the Ross Valley Sanitary District.